When I went cosmetics crazy a few weeks ago, I was actually taking a shot in the dark with some of my purchased items - particularly the Skin Food ones. Save for the fact that its endorser is Lee Min Jung, and its one of Des' favorite brands, I practically have zero experience / knowledge when it comes to Skin Food. It's a good thing bhappywithme sells testers. I can try as many items as I want without worrying too much about the price and the effectiveness of the product. Rice Mask + Rose Lemon BB cream. I had to check online because the text at the back of the pack is written in Hangul. My reading comprehension in Hangul is limited to words such as Lee Jun Ki and Super Junior, lol. A tiny glob of the Rice Mask. Anyway, back to the Rice Mask. As pictured, it's white and creamy and embedded in it are exfoliating bits of grain. It has a paste-like consistency comparable to glutinous rice - this is a rice mask after all. It has a mild scent to it, which reminded me of Johnson's Baby Soap. Since the consistency isn't as thick as mud packs, you can spread it heavily or lightly on your face. I chose the latter because I don't want to consume the whole packet in one sitting. I've used this twice this week, and my face did feel softer after. There's also a noticeable brightness to my skin, though the product is really meant to whiten. Perhaps if used long term, it might. Also, I didn't experience dryness or any allergies after each use. I'm happy with the results, but not too thrilled to buy a full-sized one. A 100g tub of this Rice Mask retails around Php 455. It's pricey by my standards since this worked more like a facial scrub rather than a facial mask to me. I feel otherwise for the BB cream, which I used in this look. 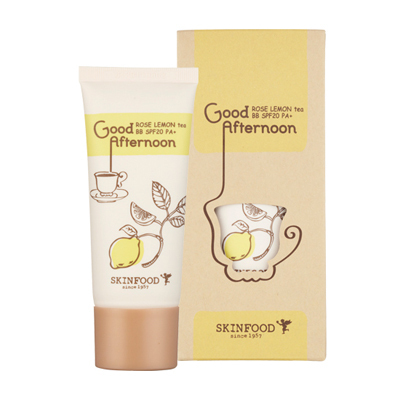 The Rose Lemon is just one of the five variants in the Good Afternoon Tea BB cream line. The entire range is listed below. The Rose Lemon was the only one available when I went eBay shopping, which is why I ended up with it. Little did I know that this was one of those water drop BB creams - the type that releases water drops once it comes contact with your skin. Squeezed a small amount out of the packet. My first reaction when I opened the packet was, "Weh?! Ano, to? Bakit parang powder?" ("Huh? What is this? It feels like powder?) Now watch what happens when you spread it out. Start spreading the news. Err, BB cream. It doesn't look like crushed chalk anymore! I may have spread it out a bit too much in this photo; there's only one tiny 'droplet' left in the middle of the BB cream-covered area. A little more spreading does the trick. 'scuse me for my parched skin. There are two color options for this BB cream, by the way. I got mine in 01 Light Beige. The other is 02 Natural Beige. One remarkable trait of this product is its scent of lemon and rose extracts - aromatic, and very pleasant. Thumbs up to this BB cream for invigorating my senses. Coverage is light, (compared to Missha's medium to heavy) but a tad too light for me. Even skin tone, achieved. Skin imperfections, still noticeable. I'd recommend this to those who don't have much too hide on their faces (read: my abominable dark undereyes), as this BB cream does improve skin texture and gives the face a natural glow. Because of its hydrating feature, the Rose Lemon BB cream didn't sink, crack, flake, or break out on my face. This one has relatively low SPF. If Missha's was low with SPF 25+, this one is even lower with just SPF 20+. It's not something you can use if you're spending an entire day under the sun. The Good Afternoon BB creams come in 30g tubes only, and retails around Php 400-450. For an imported brand, it's really affordable - as compared with Avon's 18g SPF 20+ BB creams which cost Php 399 already. Had the Rose Lemon BB cream gave me better coverage, I could have bought a full-sized tube in no time. I'll try to get hold of the other Good Afternoon variants; perhaps the other tea 'flavors' might work for me. Also, I have yet to try my Skin 79 Hot Pink Super Plus Triple Function Beblesh Balm - the BB cream with the longest name known to man. And no, that's not a typo. It's really Beblesh. Repeat after me, "Beblesh!" One more time, "Beblesh!" Again, "Beblesh!"